Three continents and 8 cities are providing some intense match ups in the Elite 8 after a competitive Sweet 16. Granada and Lisbon battle in a war on the Iberian Peninsula and the results of Casablanca versus Buenos Aires determine whether Africa or South America ends its run in this year’s tournament. All of the Elite 8 will need your votes in a short round that ends this Wednesday, March 20th at 6pm US EST. Voting in the Elite 8 is open until 6pm US EST this Wednesday, March 20th and the Final Four comes around hours later on Thursday. Those of you reading through email and RSS will have to click-through to this page to vote. 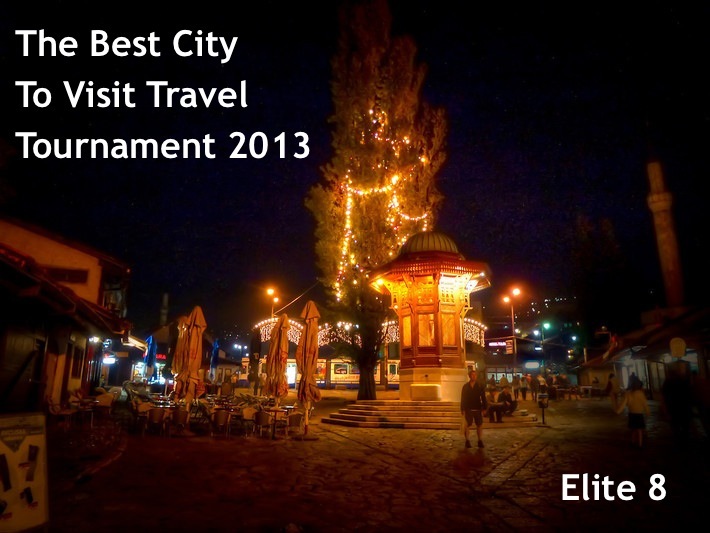 The Best City Visit To Travel Tournament 2013 Elite 8 brackets. The cities in red who’ve been eliminated and the 8 in green who are vying for a spot in the Final Four. Please keep in mind the final votes for any poll aren’t final until they’re verified by my diligent verification team. The Final Four continues on with the survivors of this round on Thursday, March 20th. The best city is Sibiu.! Bucharest is the most beautiful city!!! The best city is Granada.! Este cel mai frumos oras si ma fascineaza de fiecare data cind ma plimb ! GRANADA (probably) the best city in the world!